Today's Apple event wasn't just about iPads. Nope. 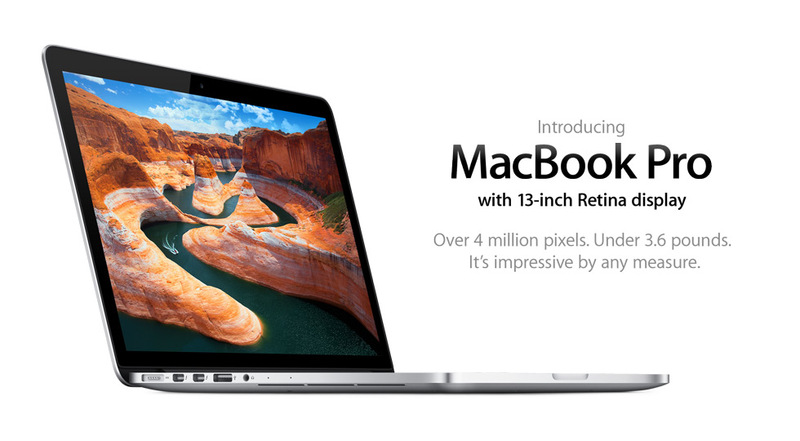 Apple also introduced new Macs too, including the new 13-inch MacBook Pro with Retina Display. SAN JOSE, California—October 23, 2012—Apple® today introduced an all-new version of its popular 13-inch MacBook® Pro featuring a stunning Retina™ display and all flash storage in a new compact design. At a mere 0.75 inches and 3.57 pounds, the remarkably portable 13-inch MacBook Pro with Retina display is 20 percent thinner and almost a pound lighter than the current 13-inch MacBook Pro. The new MacBook Pro packs more than 4 million pixels into its 13-inch Retina display, nearly twice the number of pixels in an HD television. At 227 pixels per inch, the Retina display’s pixel density is so high the human eye is unable to distinguish individual pixels at a normal viewing distance, so images look sharp and text looks like it does on the printed page. With four times the pixels of the current 13-inch MacBook Pro, you can view and edit video in pixel-accurate 1080p and see a new level of detail in high resolution images. The 13-inch Retina display uses IPS technology for a 178-degree wide viewing angle, and has 75 percent less reflection and 28 percent higher contrast than the current generation. The 13-inch MacBook Pro with Retina display is available with a 2.5 GHz dual-core Intel Core i5 processor with Turbo Boost speeds up to 3.1 GHz, 8GB of memory and 128GB of flash storage starting at $1,699 (US); and with 256GB of flash storage starting at $1,999 (US). Configure-to-order options include faster dual-core Intel Core i7 processors and flash storage up to 768GB. Additional technical specifications, configure-to-order options and accessories are available online at apple.com/macbook-pro. The 13-inch MacBook Pro with Retina display is available today through the Apple Online Store (www.apple.com), Apple’s retail stores and Apple Authorized Resellers. The full press release for the new 13-inch MacBook Pro with Retina Display can be found on the Apple website. Yet another masterpiece by Apple. I just hope there's enough space for the macbook keyboard stickers I'll be putting in. What can I say? I like customizing my own laptops. Its a truly great product.